Over 17 years of experience in the landscaping and snow removal industry. Active member of Landscape Ontario (the Industry Association that governs and sets the standards in the industry to uphold the professionalism and credentials of all its members). Fully insured and licensed (i.e. general liability, property damage and workers compensation). We practice workplace safety and are members and contributors to WSIB (Workplace Safety and Insurance Board). 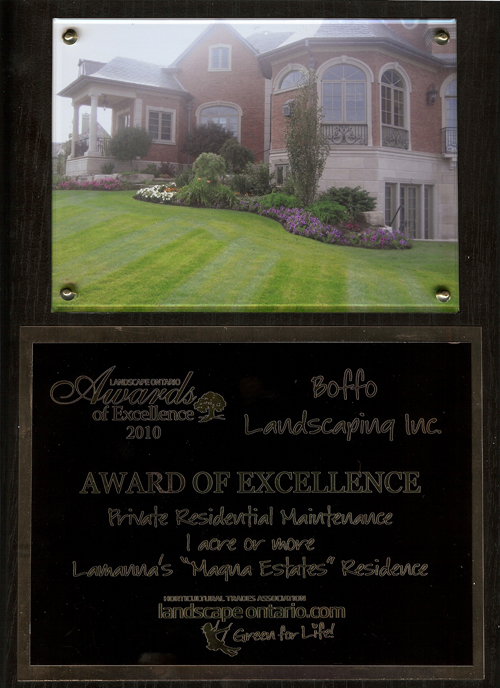 We have been awarded multiple “Awards of Excellence” distinctions, through Landscape Ontario, for our Grounds Maintenance Services and various Landscape Projects. Full service coverage - one point of contact for hassle free, year-round grounds maintenance requirements. Large Scale Snow & Ice Management: Route Managers monitor weather 24/7 and will inspect your property for any threat of snow/ice in order to ensure transparent and swift service at your location. Long track record of safety and "claims-free" business operations (i.e. no legal liabilities). Modern and well serviced machinery, equipment, and vehicles allow us flexibility to maintain service locations of any size/scope throughout the GTA. Trained and uniformed staff - efficient, recognizable, and always professional. We manage ourselves so that you can concentrate on your business - we bring value to you through our specialization. Our policy is to answer and return all phone calls within 24 hours. Our word is our bond. We do not believe in empty promises - we will provide written contracts for all service areas. Customer references are our ultimate marketing tool and engine for growth – we know they will assure you that you have chosen the right company for you!